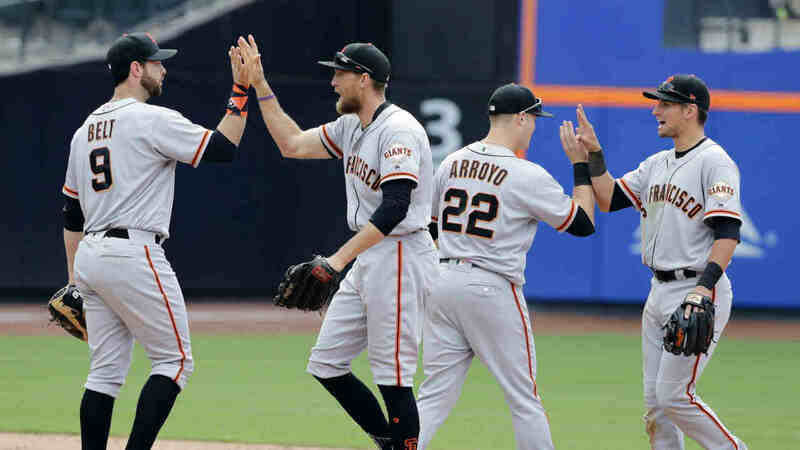 NEW YORK -- Christian Arroyo broke a ninth-inning tie with a three-run double and the San Francisco Giants took advantage of a critical error by third baseman Wilmer Flores, rallying past the New York Mets 6-5 on Wednesday to stop a five-game losing streak. Hunter Pence hit a tying single off closer Jeurys Familia in a four-run ninth that gave the Giants (12-23) only their third victory in 11 games. Buster Posey homered again for San Francisco, which heads home from a 3-6 trip with the worst record in the majors. Flores nearly tied the score with two outs in the bottom of the ninth, hitting a two-run double off the top of the left-center fence for his third hit. Derek Law, subbing for injured closer Mark Melancon, retired Kevin Plawecki on a dribbler in front of home plate for his second save. Left-hander Tommy Milone hit an RBI single and was in position to win his Mets debut before San Francisco fought back. Joe Panik drew a one-out walk from Familia (1-1) in the ninth, and Eduardo Nunez hit a sharp grounder to third. With a chance to start a game-ending double play, Flores bobbled the ball and rushed a high throw to second base. Both runners were safe, and Pence followed with a single through the left side of the infield. After a walk to Posey, Arroyo cleared the bases with a line drive to left-center. Familia, booed as he left the mound, was working for the third consecutive day - including a 6-1 victory Tuesday night. The right-hander had thrown only 15 pitches combined in the previous two outings. Bryan Morris (1-0) tossed 1 1/3 scoreless innings. Jay Bruce homered and Curtis Granderson hit an early RBI double for the Mets, who led 3-1 before Justin Ruggiano's bases-loaded sacrifice fly for San Francisco in the sixth. Posey homered in every game of the series, connecting in three straight for the third time in his career and first since June 2013. Giants starter Matt Cain allowed three runs - two earned - in five innings. Giants: As long as he checks out OK with the medical staff, SS Brandon Crawford (strained groin) is expected to come off the disabled list Thursday and play against Cincinnati. Crawford has been rehabbing at Double-A Richmond, but the Giants didn't want to push too hard and risk activating him Wednesday, manager Bruce Bochy said. ... CF Denard Span (sprained shoulder) was scheduled to play seven innings in his second rehab game with Class A San Jose. Span played five innings Tuesday night and went 0 for 2 with a walk. ... A day after Melancon (forearm) was placed on the 10-day disabled list, RHP Reyes Moronta was recalled from Double-A to replenish the bullpen for one game. Moronta was looking to make his major league debut but did not get in the game. ... Slumping 1B Brandon Belt was rested against the lefty, with Posey starting at first base and Nick Hundley catching. Belt flied out as a pinch hitter with a runner on second to end the eighth, leaving him in slides of 0 for 18 and 3 for 31. Mets: Hot-hitting LF Michael Conforto didn't start to rest his tight hamstring for two days in a row, including Thursday's off day. SS Jose Reyes moved back up to the leadoff spot. He walked, stole second and scored in the first inning. Conforto singled as a pinch hitter in the eighth. ... SS Asdrubal Cabrera was held out of the lineup for one more day to rest aching legs. Cabrera hasn't started since hurting his left thumb on a dive last Saturday, but that seems to be better. He pinch hit for the third straight game and struck out with the bases loaded and one out in the sixth. ... 1B Lucas Duda (hyperextended left elbow) is expected to be activated from the DL on the team's upcoming road trip, manager Terry Collins said. He hopes to get Duda back this weekend in Milwaukee. The slugger has been rehabbing at Class A St. Lucie. Minnesota claimed LHP Adam Wilk off waivers from the Mets. Wilk was hastily called up Sunday from Triple-A Las Vegas on short notice and little sleep to fill in for suspended New York starter Matt Harvey. Wilk was hit hard in a 7-0 loss to Miami and designated for assignment the following day to make roster room for Milone. Giants: LHP Ty Blach (0-2, 5.66 ERA) starts Thursday night against Reds RHP Bronson Arroyo (3-2, 6.53) when San Francisco opens a seven-game homestand. Blach gave up 10 runs and 11 hits, both career highs, in three innings last Saturday at Cincinnati. Mets: Harvey (2-2, 5.14 ERA) pitches Friday in Milwaukee, his first start since serving a three-day suspension imposed by the team for skipping Saturday's game against Miami following a late night on the town. The former ace is coming off two of the worst outings of his career in a pair of losses to Atlanta. RHP Matt Garza (1-0, 2.55) goes for the Brewers.